A newly completed underwater survey of the seafloor of Moreton Bay has uncovered a closely guarded secret fishing wonderland in the form of a huge sinkhole. Centred roughly between Mud Island and Moreton Island this huge sink hole the size of ANZ Stadium is rumoured to be the home of some huge breeding populations of fish. Highly regarded species such as snapper, flathead, whiting and mangrove jack are in abaundance with some truly trophy sized specimens amoung them. Well there is no missing the sinkhole slighty up and to the right of centre and I would expect the fishing reports from this new Moreton Bay landmark to flow in thick and fast. It is certainly a sizable piece of real estate and its greater depth than the surrounding area will act like a beacon to any passing fish. 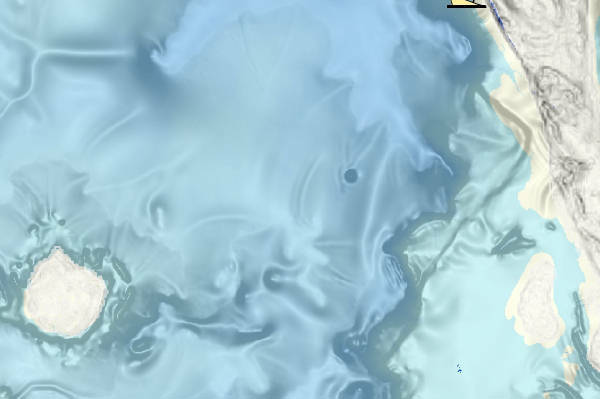 To get a feel for the size of the hole itself, the large white blob on the left hand of the map is Mud Island, which although much larger gives an indication of the incredible size of this new underwater find. Having fished this area extensively for years I can't say I have ever happened upon it previously although it is not on the route to any of many other fishing destinations. However a number of people have claimed to have known of its existance and either not fished it or released fish caught from the area. It is somewhat disappointing that the EPA did not have this information so they could have ensured a potentially delicate habitiat such as this one some level of protection with their proposed green zones. We can't stress enough the need to tread lightly in areas like this, however experience tells that this area will be like a carpark every reasonable day for a long long time. Anyone fretting over the lack of posted GPS marks for the sink hole should head east from Mud Island then look for the boats approximately half way over to Moreton Island, with soundings around 24 metres confirming you are in the right place. Like a monsterous pimple on the face of the bay, this stand out feature is but one of the many secrets which have been revealed by this Maritime Safety Queensland and SEQ catchments release. A plethora of significant areas of interest to the fishing and diving fraternities should have depth sounders and fish finders working overtime. St Helena Island, Green Island, Wellington Point, Mud Island inside the bay as well as offshore Moreton and Stradbroke Islands have revealed new wrecks and form that is well worth investigating.